This premium shed has all the aesthetics of a traditional wooden shed but with the added benefit of a tough metal exterior that will ensure your shed is durable and offers the ultimate protection for your equipment for many years to come. 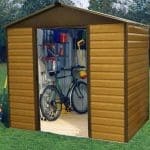 This is a great looking premium metal garden shed and is completely maintenance free. It is handsomely finished in wood grain and will look fabulous in any garden setting. Complete with ventilation front and back and with large, sliding doors this shed has everything you need to complete your garden. 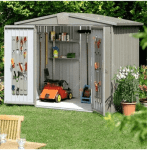 There is ample storage inside for gardening equipment, garden furniture and children’s toys and the way this has been constructed means that it is rustproof and weather proof so everything remains clean and dry. As well as storage, this particular shed is excellent for working in too, so you can pot your plants or kick back, relax and pick up your favourite gardening book when you need a break! With an 8x6ft interior, the space that this shed provides would be fantastic for storing the average family’s outdoor and garden equipment. With a wide opening through the sliding double doors you can access all of your items easily. 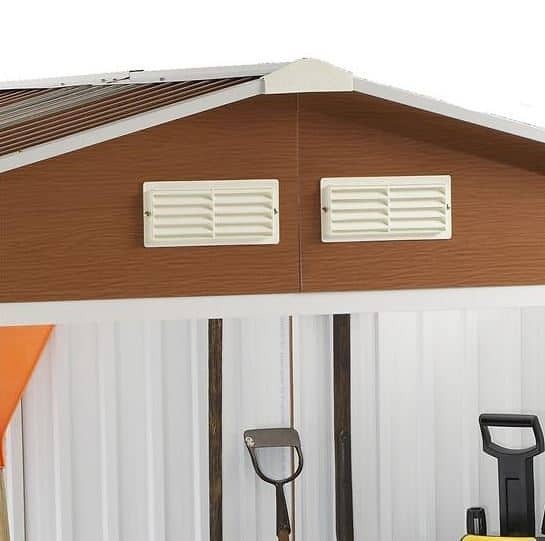 If you have looked at the complete range of sheds available you will know that there are a lot of models to choose from, ranging from traditional wooden sheds to plastic and metal sheds. 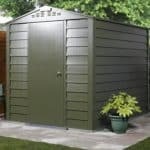 Below the team at whatshed.co.uk take a look at this particular model’s many features to help you decide whether a metal shed is right for your garden and if this particular model meets your requirements. Exterior: The exterior of this shed is a natural brown wood grain finish that will blend into the natural surroundings of your garden. With ribbed wall and roof panels constructed from galvanised steel for extra strength, your items will be protected from the elements all year round. 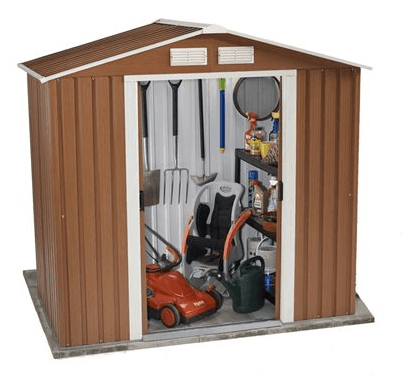 Totally maintenance free, this shed can be easily cleaned by hosing down with water. Interior: The 8x6ft interior is more than adequate for the average family’s belongings. Store all of your outdoor and garden equipment with ease, with the potential to add freestanding shelving if further storage space is required to keep smaller items and tools neat and tidy. Doors: The wide double sliding doors allow easy access to your items, the easy access ramp making it simple to take things in and out as you please. Standing at the doors gives you a great overview of the contents of the shed without having to enter. Security: The double doors are pad lockable for security for your equipment and peace of mind for you. The Billyoh Sherwood Wood Grain Metal Shed: How easy to build? Thanks to the simple design and smaller, easy-to-handle parts of this shed, assembly is straight forward even for complete DIY novices. A full set of instructions is provided, including a detailed step by step guide and easy-to-follow diagrams should you become unsure of anything along the way. 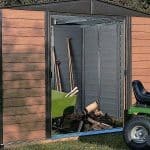 The smaller size of this shed means that an individual could assemble it on their own, however the manufacturers do recommend a team of two people work together purely for safety reasons or if time is an issue. All parts, fixtures, screws and nails are provided and we expect that this shed could be assembled within a day. The Billyoh Sherwood Wood Grain Metal Shed: What is the overall quality like? With the Sherwood Metal Shed, Billyoh has designed a shed with the best of both worlds, combining the aesthetics of a traditional wooden shed with the strength and durability of a metal shed. The galvanised steel exterior with an attractive wood grain finish means your shed is both attractive and practical whatever the weather. 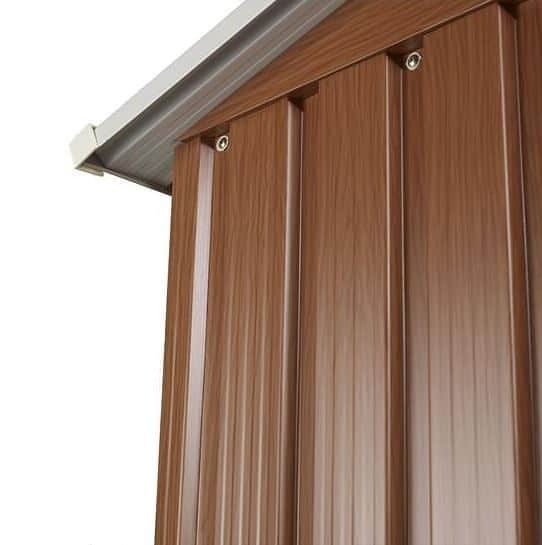 Corrugated wall and roof panels giving your items inside the extra protection they need even in the harshest weather conditions. Billyoh provide a 15 year warranty against rust perforation proving the confidence they have in the quality of their products. Ventilation to the interior is provided through front and rear vents in the roof, allowing fresh air to circulate. 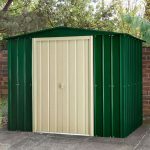 Due to the materials used in construction, the Sherwood metal shed is completely maintenance free, meaning this shed would be a fantastic choice for those with little time or simply not wishing to spend time worrying about treating a shed every so often. The Billyoh Sherwood Wood Grain Metal Shed is a premium shed in both design and materials used for construction. 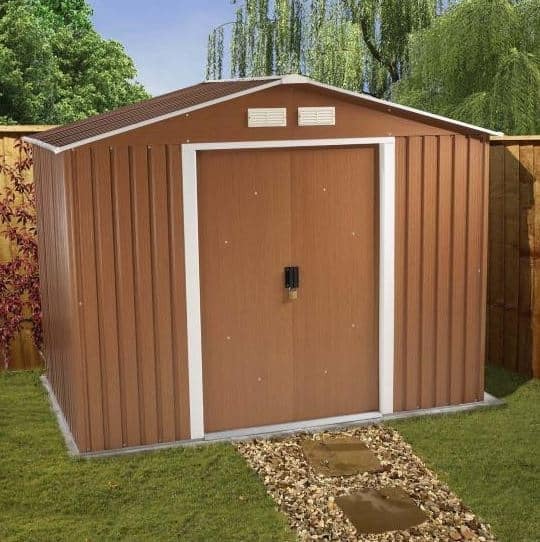 Completely maintenance free, this fantastic shed is both weatherproof and has a 15 year warranty against rust perforation. 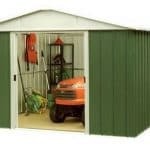 At this great price it is ideal for those wanting a high performance shed that requires no attention whatsoever. Perfect for storage of your outdoor and garden equipment all year round – an excellent buy!